Morriston RFC Male Choir is based in the town of Morriston, a suburb of Swansea in South Wales. Formed in 1979 by members of the local rugby club, it has progressed to be one of the foremost Welsh choirs, and regularly performs free of charge to raise funds for charities and good causes in churches, chapels, and prestigious concert venues around the UK. All we ask is a contribution towards expenses. We also sing (for a fee) at weddings and social and corporate functions. Engagements are added and updated regularly. Keep an eye on this website and social media for details when available. 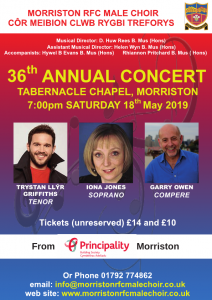 With Trystan Llyr Griffiths Tenor, Iona Jones Soprano and Garry Owen Compere. Saturday 06th July @? TBA - Swansea Air Show, Cenotaph Swansea for The Royal British Legion. More details to follow. Sunday 14th July @? TBA - Neath Musical Festival, Neath. More details to follow. Friday 04th October @ 1.00pm - Private Function. Wedding, St Thomas Church, St Thomas, Swansea. Saturday 19th October @ 7.00pm - 40th Anniversary Concert, The Great Hall, Swansea University. A very special occasion for the Choir. Saturday 09th November @ 7.00pm - Festival of Remembrance, Brangwyn Hall, Swansea. Saturday 07th December @ 7.00pm - Concert for "Friends of Penllergaer Woods", St David's Church, Penllergaer.